New members will qualify for this assistance as well as current members who are currently serving on a committee or on the board. New members will be expected to serve on a committee. The amount of subsidy will be no greater than 50% of National Membership dues. Dues assistance will only be considered for Professional, Young Professional, Associate, and Retired Collegiate and Global e-membership levels are specifically excluded. All dues assistance checks will be made payable to AFP unless proof of payment is included in the request. Each application will be judged on its own merit. Scholarship committee decisions are final. 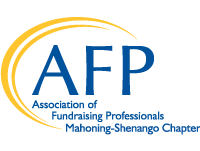 It is the tradition of the AFP Mahoning/Shenango Chapter to assist in payment of membership dues. The purpose of this assistance is to enable persons to participate in the benefits of AFP membership who are volunteer fund raisers, in part-time positions, or employed as fundraisers by smaller agencies. Priority consideration is given to self-employed members or members whose agencies cannot or do not assist with payment of AFP dues. New members qualify for this assistance as well as members who are currently serving on a committee or the board. New members are expected to serve on a committee.